Official Football Manager Hints and Tips which are applicable across both the full FM PC game mode and FMC. 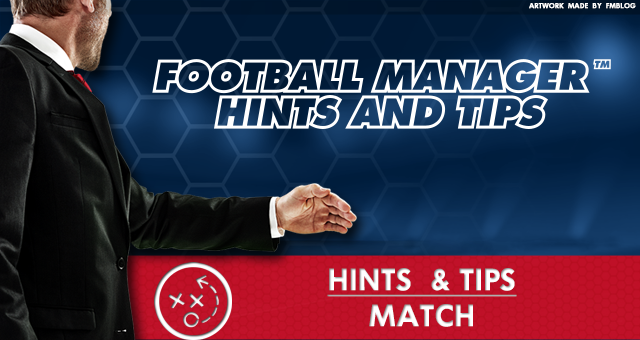 Let's take a look at Match Hints and Tips for FM. Hints and tips are both for beginners as well as for more advanced players of Football Manager games, they will appear in Football Manager based on your manager experience. Credits: Miles Jacobson, Neil Dejyothin, Svein E Kvernoey, Kevin Turner, Nick Habershon, Alex Bell, David Milmine, Thomas Roddison, Andy Jones, Lee Smith-Bryan, Rashid D Abdullah, Andy Wilson and Glenn Wakeford. When an icon with a green cross appears next to a player it indicates he is carrying a knock. Using easy or normal tackling in a match will reduce the risk of your team picking up cautions or red cards, particularly if the game is being officiated by a strict referee. Be aware of how the weather can affect your team's performances. Bad conditions are more likely to penalise those who play a short passing game, try adopting a more direct style at times like this. Players with low stamina may tire and struggle to play at their best, particularly in poor weather conditions or high tempo games. When watching a match you can keep an eye on the opposing team's formation and changes made during the game by selecting 'Formations' from the 'Analysis' section of the match screen. A playmaker is someone who generally looks to receive the ball and dictate play. A target man is someone who will look to bring others into play via flick-ons or holding up the ball. Constantly changing your tactic and making dramatic alterations to the style of play will not help your players settle or find their rhythm and is likely to have an adverse affect on the team's performances. Allowing too many players to have a high level of creative freedom will likely see your team fail to adhere to your tactical instructions. Use creative freedom sparingly for full effect. Passing style and tempo are linked. A short passing game works best with a slower tempo, whilst a direct, counter attacking style needs to be swift and quick. If you like to play possession football and dictate the tempo setting your goalkeeper's distribution to short and to a near player may help you succeed. Time-Wasting is useful late in the game but be sensible - employ it too early it can backfire and cost you the game. Taking the time to set up player positions on set-pieces can be very rewarding. Taking advantage in these situations is often the difference between a draw and a win. Allowing your players to close down often will naturally put the opposition players under duress, but be aware that good players will find ways to avoid pressure and expose your team. Players who pick up knocks but have no injury indicator may be able to shake off their injury and return to a good level of fitness later in the game. Determination can be a key attribute. Players with low determination usually react badly to going a goal down. If you find you're leaving too much space behind your defence, try setting your centre-backs mentality to 'Defensive' or using a deeper defensive line. When playing against a strong team, you may get some success by playing on the counter attack. This can be particularly effective when playing away from home. When trying to hang onto a result, a good way to wind down the clock is to employ time wasting tactics in the latter stages of a game. Defenders with low concentration are more prone to making costly mistakes in defence. Strikers with low composure are more prone to buckling under the pressure and missing one-on-one opportunities to score. New signings need time to settle in and gel with their new team-mates. Too many new signings in a short space of time can upset the balance and rhythm of your team. Foreign players with a distinctly different football cultural upbringing may take a while to settle into playing a different style of play. The ‘Get Ball Forward’ touchline instruction will encourage your players to move the ball into the opponent’s territory with greater urgency. This is ideally used when your team is chasing the game and needs a goal. The ‘Retain Possession’ touchline instruction will encourage your players to keep hold of the ball and play a low-risk strategy, with the emphasis on controlling the game. This is ideally used when your team is looking to protect a lead. The ‘Pass Into Space’ touchline instruction will encourage your players to look to pass the ball into open areas of the pitch, rather than directly into a teammate’s feet. This is ideally used when your team possesses quick players who will be able to reach the ball ahead of the opponent and can take advantage of the extra space. The ‘Pass To Feet’ touchline instruction will encourage your players to look to pass the ball into the feet of their teammates, rather than into space or away from the body. This is ideally used when your team possesses agile, capable technicians who can move the ball accurately and at speed, drawing the opposition towards them in an attempt to create pockets of space. The ‘Pump Ball Into Box’ touchline instruction will encourage your players to ignore their basic tactical instructions and adopt a direct approach to get the ball into the opposition’s penalty area as quickly as possible. This is ideally used when your team is chasing the game and needs a goal. The ‘Clear Ball To Flanks’ touchline instruction will encourage your players to look towards the sidelines when clearing the ball from danger, rather than keeping it in a central position. This is a sensible approach as the ball is further away from the goal, and can be an effective counter-attacking strategy if you possess quick wide players who can swiftly transition into attack. The ‘Shoot On Sight’ touchline instruction will encourage your players to take a shot at goal as soon as an opportunity presents itself. This can be effective if your team includes a number of capable finishers, but also increases the chances of scoring simply by ‘buying a ticket’. The ‘Work Ball Into Box’ touchline instruction will encourage your players to attempt to play their way into attacking positions with patience and creativity. This is ideally used when your team features quality attacking playmakers and effective passers, but is a strategy which may struggle to break down well-organised teams that defend deep. The ‘Exploit The Flanks’ touchline instruction will encourage your players to stretch the pitch and use their wide players to make an attacking impact. This is ideally used when your wide players are amongst your most effective, or when the opposition is struggling at full-back. The ‘Exploit The Middle’ touchline instruction will encourage your players to contract the pitch and play the majority of the game in central areas. This is ideally used when your central players are amongst your most effective, or when the opposition is struggling at centre-back or in central midfield. The ‘Look For Overlap’ touchline instruction will encourage your wider players to hold onto the ball and wait for the full-back to overlap them into an attacking position. This is ideally used when you have a very effective attacking full-back and can be an additional tool in breaking down tough defences. The ‘Take A Breather’ touchline instruction will encourage your players to keep hold of the ball with no specific intention other than to rest with it and recover some of their energy. This is ideally used when you ask your team to adopt a high-intensity pressing game or a high-tempo attacking game which have a greater impact on fitness levels. The ‘Play Wider’ touchline instruction will encourage your players to stretch the pitch even further in a bid to draw a well-organised defence out of their comfort zone and take advantage of the wider spaces between defenders. The ‘Play Narrower’ touchline instruction will encourage your players to contract the pitch even further and play the majority of the game in central areas. This is ideally used when your central players are amongst your most effective, or when the opposition is struggling at centre-back or in central midfield. It can also help solidify your defensive structure and force teams to play on the periphery, further away from the goal. The ‘Push Higher Up’ touchline instruction will encourage your defenders to adopt a higher defensive line, and in turn force your team to play closer to the opposition’s goal. This has the effect of putting your team on the front foot and forcing the opposition to play in a compact, congested area. The ‘Drop Deeper’ touchline instruction will encourage your defenders to collapse towards their own goal and play a much deeper line, which in turn encourages the rest of the team to drop into their own half. This makes it harder for opponents to break you down and can be used either as a strategy to preserve a lead late in a game, or as a tactic used against much better teams in order to frustrate them. The ‘Press Opponents’ touchline instruction will encourage your players to set about winning the ball back from the opposition with relentless hassling and pressing. Adopting this strategy requires players with high levels of stamina in order for it to be most effective. The ‘Stand Off Opponents’ touchline instruction will encourage your players to work in a cohesive and organised fashion when defending, with the focus on a solid formational shape and making it hard for the opposition to find space. This makes it harder for opponents to break you down and can be used either as a strategy to preserve a lead late in a game, or as a tactic used against much better teams in order to frustrate them. The ‘Get Stuck In’ touchline instruction will encourage your players to be more aggressive in the tackle and assert themselves on the opposition in a bid to get the upper hand psychologically and physically. The ‘Stay on Feet’ touchline instruction will encourage your players to stay on their feet when tackling rather than diving in and going to ground. This reduces the chances of an opponent hurdling an attempted tackle and leaving your team outnumbered in defence. The ‘Take More Risks’ touchline instruction will encourage your players to gamble in pursuit of a goal and not worry about their defensive responsibilities. This is largely intended as a strategy for use late in games when chasing a goal as it will almost certainly leave your team short of numbers at the back (including the goalkeeper at set-pieces when used in conjunction with the ‘Overload’ team strategy in the closing minutes of a match). The ‘Run At Defence’ touchline instruction will encourage your players to dribble at defenders when attacking. This is most effective when your team possesses quick and agile dribblers who can beat their man and take full advantage of their abilities. The ‘Play Out Of Defence’ touchline instruction will encourage your defenders to look to build attacks from the back with shorter passing rather than a more primitive long-ball forward. The ‘Hit Early Crosses’ touchline instruction will encourage your players to put crosses in almost as soon as they pick the ball up in wide positions. This can be an effective strategy if you also have forwards with high off the ball and anticipation ratings, as they will be able to take full advantage by reacting first. The ‘Play Through Defence’ touchline instruction will encourage your players to look to break down opposing defences with passing and movement rather than pace and dribbling. This can be an effective strategy if you are fortunate to have good quality passers with the vision and technique to break down a defence. Football Manager match hints and tips that advise you what to do during your team playing a game.